Rental Rate: $99 a Day. This is a quick play skill carnival game. Player gets three tries to get the puck past the goalie. One in wins first. 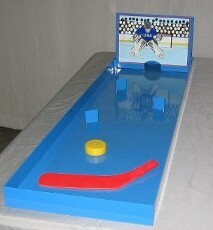 The game is 16x12x60 and weighs 40 lbs. It comes with one stick and 1 puck.